Are you studying for the FAA’s Part 107 exam (aka – commercial drone) and looking for some free study resources? Hey! I’m David. Founder of Drone Launch Academy. Hey! 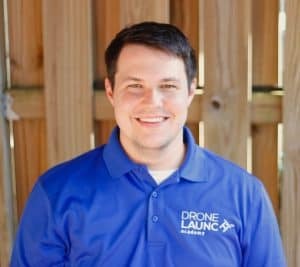 I’m David Young, Founder and Chief Instructor here at Drone Launch Academy. Really quick intro about me… I am an FAA-certified advanced ground instructor, private pilot, remote pilot, and a former FBI Forensic Accountant (weird twist, I know). Over the last few years, I’ve helped thousands of drone pilots pass their Part 107 exam and get started in the world of commercial drones through our Drone Launch Academy courses. I wanted to also make sure that we had some really high-quality, free information available to everyone who is considering getting their remote pilot certificate and becoming a professional drone pilot. That’s why we made this guide! In this free guide, we are going to go over the 21 most missed questions that you are sure to see on test day. To start with, if you’re not sure what the Part 107 exam is or are unfamiliar with what you have to do in order to fly drones commercially in the United States, we recommend first reading our article The Basics of Commercial Drone Rules that will get you up to speed. Then come back here when you are ready to study for your Part 107 exam and become a certified commercial drone pilot! 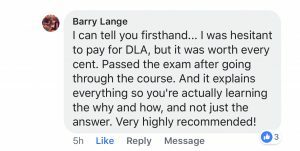 Here at Drone Launch Academy, we’ve trained thousands of students to successfully pass their Part 107 exam and have seen our fair share of what students struggle with the most. How to know what airspace you’re in: Are you allowed to be there? 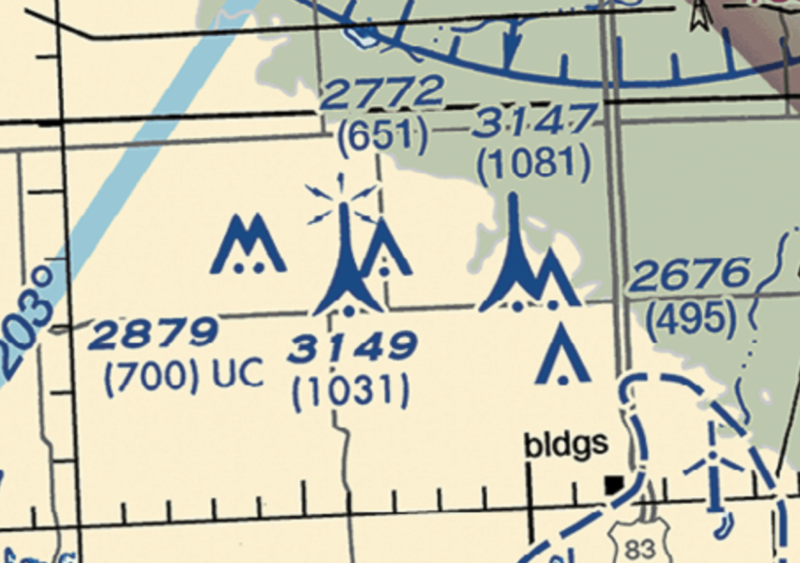 Reading sectional charts (aka – aviation specific maps): What do all of those symbols mean? Part 107 Operating Rules: What do the regs say about what I’m allowed to do as a commercial drone pilot? Loading and Performance: How does drone fly under different loading conditions? Aviation Weather: How does weather impact safe drone operations? Drone Maintenance: What are your responsibilities as a drone pilot? Physiological Factors: How does your mental and physical state impact your ability to operate a drone safely? In the questions below, you will frequently see something like “(Refer to FAA-CT-8080-2H, Figure 23, area 3)”. This is telling you to look at some supplemental test materials that the FAA will give you on test day. These supplemental materials will have sectional chart excerpts, weather reports, and other charts and graphs you will need to reference in order to answer the questions. If you can’t decide what drone to get, this one is my favorite right now. Okay, let’s get into the questions! (Refer to FAA-CT-8080-2H, Figure 23, area 3) A client has hired you to inspect a tower on Tuesday. 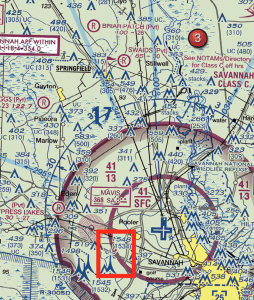 The tower to be inspected is the lighted tower 6 NM SW of Savannah/Hilton Head Intl (SAV). At the highest allowable flight altitude above the tower, what airspace would you be in? There is a lot going on here! Let’s break it down. 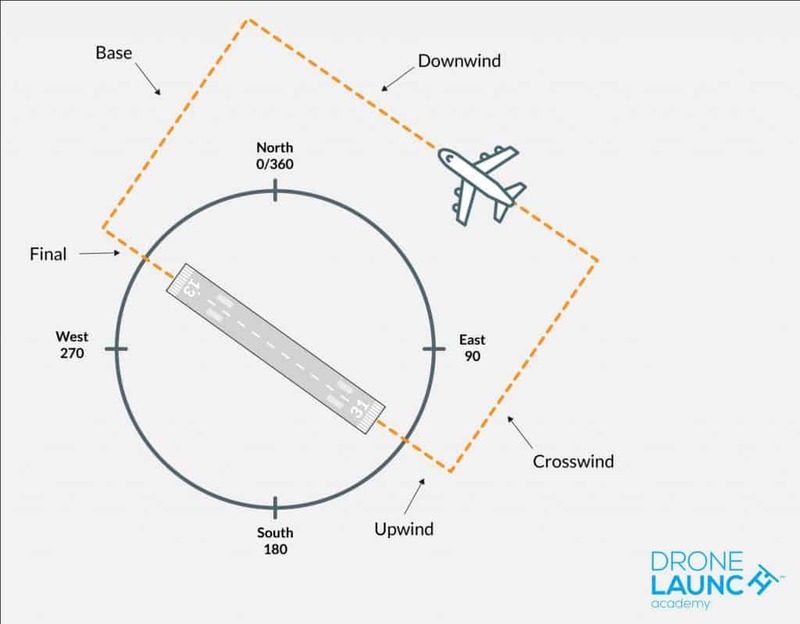 This question is going to test your ability to find objects on a sectional chart and determine airspace classes. To start, you will need to locate Figure 23 in the FAA supplemental materials. On a sectional chart, it will have red circles with numbers in them. The numbers are used when the question ask you to refer to a specific area. In this case, the question asks us to locate the lighted tower near area 3. Looking below area 3, we can see that the Savannah/Hilton Head International airport is below area 3. To locate the tower, you will need to find the lighted tower that is located southwest of the airport. Lighted towers will have a light emitting icon on the top of the tower on the sectional chart. So, how do we use the information 6 Nautical Miles Southwest to our advantage? This is where the FAA could do better on distance measurements on the section charts. On each sectional chart figure, there will be a legend either at the top of bottom of the chart. The chart will display blocks that are used to measure with. The three measurements are Nautical Miles, Statute Miles, and Kilometers. You can either use a scratch piece of paper or even your finger to estimate the distance on the map when trying to locate what you’re looking for. In doing this, you will locate the lighted tower that is labeled as 1,548 (1,534). This tells us that the tallest obstruction (aka – tower) goes up to 1,548 feet Mean Sea Level (MSL) and 1,534 feet Above Ground Level (AGL). This tower is the only lighted tower Southwest of the airport. Remember when we said that some objects might not be near the area number? That was the case here, so make sure you are careful about that. The next thing you need to know for this question is how far ABOVE the tower are you allowed to fly with your drone. The Part 107 regulations say that you are allowed to fly your drone within a 400 foot radius of a structure (including directly above). So if a tower was 1,000 feet above ground level, you could legally fly your drone to 1,400 feet above ground level (1,000 feet + 400 feet). So, in the case of this question, we know that the tower height is 1,534 feet AGL (or 1,548 feet MSL). Our max flight altitude would be 400 feet above that: 1,934 feet AGL and 1,948 feet MSL. Class C airspace is depicted by thick magenta rings around the airport. In Class C airspace, there are usually two layers: the inner ring and the outer ring (or “shelf”). The tower is located in the outer shelf of Class C airspace, labeled as 41/13. When you see a number that looks like a fraction on a sectional chart; it’s usually referring to the ceiling and floor of a certain type of airspace. The 41 is short for 4,100 feet MSL and the 13 is short for 1,300 feet MSL. This means that our max allowable flight altitude over this tower (1,948 feet MSL), would put us into Class C airspace (since it’s above 1,300 feet MSL and below 4,100 feet MSL). 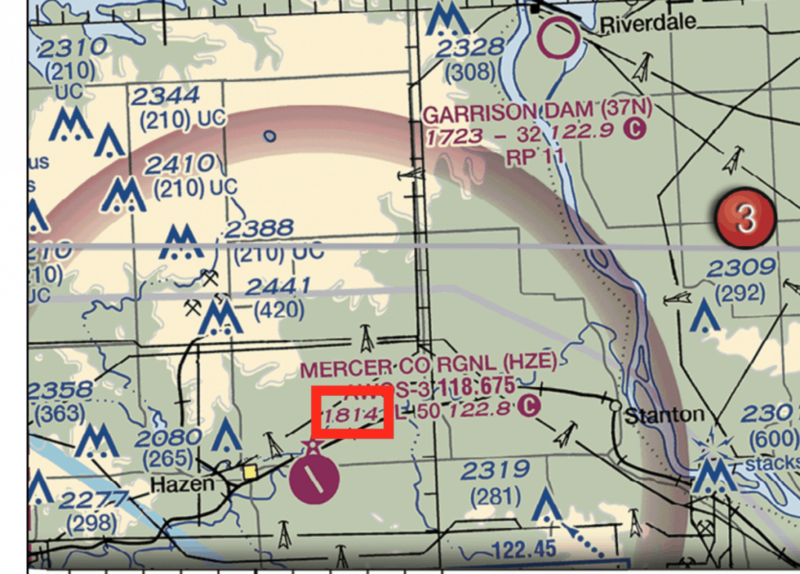 (Refer to FAA-CT-8080-2H, Figure 21, area 3) What is the floor of the Class E airspace surrounding Mercer Co Rgnl (HZE)? In this question, the FAA is going to test your ability to read airport information and do some math. (They will also try to trick you with mean sea level vs. above ground level altitudes). But don’t worry! We are not doing calculus here, just some basic addition. The question asks us to find the floor of the Class E airspace surrounding Mercer Co Rgnl. The first thing you need to know is that the “floor” is where a certain airspace begins (as far as altitude is concerned), so this is the “bottom” of the airspace. Looking at the sectional chart, we can see that Mercer is surrounded by a thick fuzzy magenta circle. This means it is Class E airspace that starts at 700 feet AGL. If we look at the answer choices, 700 feet AGL is not on there. (Don’t make the mistake of choosing 700 feet MSL!) Uh oh. What do we do from here? Well, this means that the FAA is probably giving us an answer choice in mean sea level (MSL) altitude, which means we need to figure out how high 700 feet AGL is in mean sea level at the location of the airport. Now that we know the controlled airspace begins at 700 feet AGL, we need to look at the elevation of the airport. The elevation can be found under the airport name that is depicted in magenta text. There will be a number that reads “1,814”, this is the elevation of the airport in feet mean sea level (MSL). We need to take the 700 feet AGL and add it to this number to get the floor of Class E airspace in MSL. To help you better understand mean sea level (MSL) vs. above ground level (AGL) altitude, think about if you were climbing a mountain right next to the ocean. If you were at the bottom of the mountain, standing on the ground, you would be at an altitude of 0 feet mean sea level and an altitude of 0 feet above ground level. As you climbed the mountain, your altitude relative to sea level (MSL) would be increasing, but you would still be standing on the ground, so you would always be at 0 feet above ground level (AGL). If you climbed to 1,000 feet MSL on the mountain, and then decided to climb a tower that was 50 feet high, you would now be at an altitude of 1,050 feet MSL and 50 feet above ground level (AGL). You apply this same concept to this question. First you determine the airport’s elevation in MSL, then you go up an additional 700 feet (for Class E airspace with a shaded magenta circle). That will give you the MSL altitude for the floor of the Class E airspace. By adding the two numbers in our question: 1,814 feet (elevation of Mercer airport) + 700 feet for the floor of the airspace, we get the floor of Class E airspace in MSL: 2,514 feet. (Refer to FAA-CT-8080-2H, Figure 25, area 7) What is the ceiling of controlled airspace at Collin Co Rgnl McKinney (TKI)? This question is one of the simpler questions, yet it still trips many people up. Looking at area 7 of figure 25, we find Collin Co Rgnl McKinney airport. We can see that the airport is surrounded by a dashed blue line. This indicates that the airport is surrounded with Class D airspace. There is usually only one ring in Class D airspace, which always begins at the surface. In Class D airspace, the ceiling will be depicted by a number within brackets. We can see the number “29” in the brackets, which tells us that the ceiling of the airspace is 2,900 MSL. (Refer to FAA-CT-8080-2H, Figure 21, area 2) What is the CTAF frequency at Garrison (D05)? Understanding how to listen to and find other aircraft in the airspace around you is critical to being able to operate a drone safely – especially when operating in the vicinity of an airport. At airports that don’t have control towers, manned aircraft pilots will “self-announce” their position as they are coming in for a landing or taking off. They will make these announcements on a certain radio frequency for the airport known at the “CTAF”, which stands for Common Traffic Advisory Frequency. Question on CTAFs are sure to show up on your Part 107 Exam, so make sure you know how to identify what the frequency is for a given airport. The frequency number is easy to locate when looking at a sectional chart. The numbers will always be followed by a solid circle with the letter C inside. Keep in mind that not all airports will have a CTAF. In this case, the CTAF frequency is 122.9 and we know this because the CTAF symbol follows the number. This information will always be below the airport name if it’s available. (Refer to FAA-CT-8080-2H, Figure 20, area 3) What type of airspace surrounds Elizabeth City Rgnl (ECG)? This question is fairly straightforward and pulls from what we’ve covered in some of the questions above around knowing how different types of airspace are indicated on the sectional chart. Looking at the chart, you can see that the Elizabeth City Rgnl airport has a blue dashed circle around it. This means that it is Class D airspace. Pretty simple! This question tests your knowledge of the regulations surrounding commercial drone use and its applicability to different types of operations. FAA Advisory Circular (AC) 107-2, Part 4.1, specifically lists 8 types of operations that Part 107 does NOT apply to. The two most heavily tested of these items from this list are #1: Model Aircraft that are operated in accordance with part 101, subpart E, and #7: Public Aircraft Operations. What increases the load factor on a fixed wing airplane? Fixed-winged aircraft, whether it is manned or unmanned, share many of the same attributes. When an aircraft goes into a level turn, the load factor on the wing is increased. This is because in order to not lose altitude, the pilot has to “pull back” on the controls to keep the nose up, and this increases the stress on the airplane. Think about when you are on a rollercoaster and the tracks bank left to put you into a tight circle. You will feel like you are being pushed into your seat from the centrifugal force. That is the same concept with a fixed-wing aircraft. You had several drinks yesterday and are experiencing a hangover today. Even though the last drink was over 8 hours ago, would you still be allowed to conduct commercial drone flight operations today? 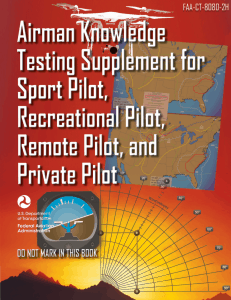 Part 107.27 states that all remote pilots must follow the same alcohol rules as regular manned aircraft pilots, which are found in 14 CFR Part 91.17 and 91.19. No aircraft may be operated while under the influence of alcohol (regardless of time passage). In the eyes of the FAA, a remote pilot cannot operate a drone when they are experiencing a hangover, even if they waited 8 hours and are below the legal limit. A hangover is still a state of impairment that could threaten the safety of the mission. Any form of impairment or influence of alcohol prohibits the pilot from operating a drone under the Part 107 regulations. (Refer to FAA-CT-8080-2H, Figure 74, area 3) Where would you go to obtain more information about restricted airspace R-2531? You can’t see this from the excerpt the FAA gives you in the booklet, but on a REAL sectional chart map, there are additional pieces of information, “Notes”, that are printed in the margins. Here you will find more information about special use airspace (such as restricted airspace R-2531). At what altitude does wind shear occur? Wind shear can occur at any altitude and it is deadly when a manned aircraft encounters wind shear. When flying a drone, wind shear at low altitudes can cause updrafts and downdrafts making the drone unstable. Severe wind shear can bring down a drone at any altitude if strong enough. Wind shear is caused when there is an extreme change in wind speed and/or direction in the area. Wind shear is not always easy to predict and can vary in direction, altitude, and speed. Typical wind directions for wind shear make 180 degree changes and speeds of 50+ knots. If you see your drone getting thrown around unexpectedly, it may be from wind shear. To find out more information about parachute operations in the vicinity of an airport, what would you look at? 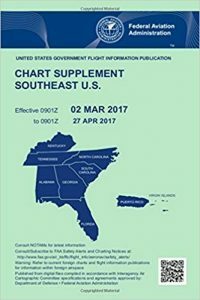 The Chart Supplements/Airport Facilities Directory contains a wide range of information pertaining to operation at (and in the vicinity of) different airports all over the country. 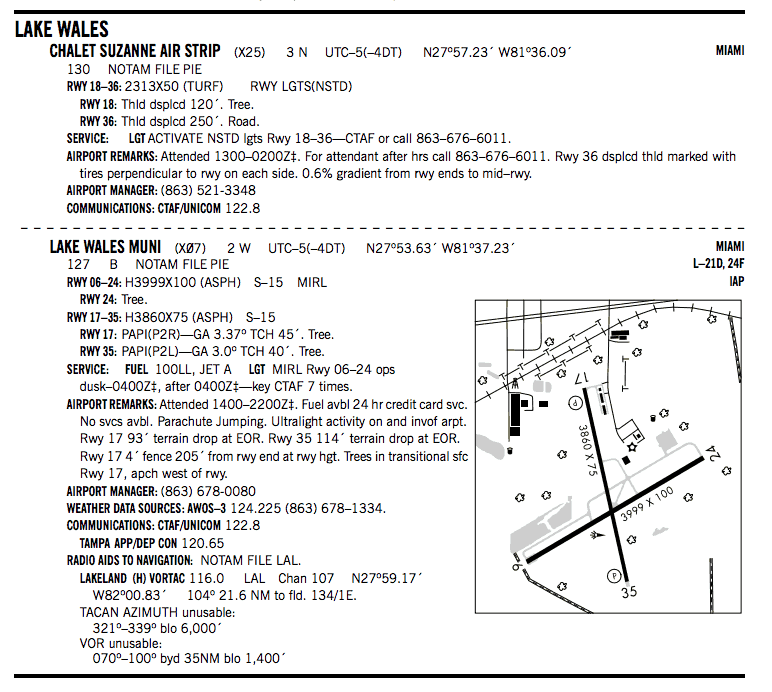 For instance, the image below shows the chart supplements for Lake Wales Municipal (X07) airport in Florida. If you look in the “Airport Remarks” section, you will see a notice to pilots about parachute operations in the vicinity, along with other potential hazards and items for pilots to be aware of. So our answer for this one is Chart Supplements/Airport Facilities Directory. During a crash, the lithium battery in your UAV is dislodged from its compartment and is found on the ground, 5 feet from the aircraft. You notice a dent in the battery, what should you do? Accidents happen. With drones it’s not if it happens, but when it happens. A battery might get a ding or scratch, but it does not mean the battery is rendered totally unsafe. You will notice on the exam that the FAA will occasionally defer to the “manufacturer’s recommendation.” This is largely due to the fact that there are so many types of drones out there that each drone may require a different set of actions to maintain safe operation when it comes to maintenance. Another principle to remember is that test takers should choose the BEST answer. There may be good answers (in this example, answer choice A doesn’t sound totally unreasonably), but the FAA is looking for you to choose the BEST answer out of the three. In this instance, the FAA wants you to proceed with caution and defer to the manufacturer’s recommendation for the particular drone that you are flying. It is 7:00 am. Official sunrise is at 7:40 am. Your UAV does not have any anti-collision lighting. How long do you need to wait before you can fly under Part 107? If you don’t read this question carefully, you might end up getting it wrong on your Part 107 exam, so look closely! For this question, you will need to know the rules around the times of day you can fly your drone under Part 107. The Part 107 regulations (Part 107.29) state that remote pilots can fly from sunrise to sunset with no additional lighting on the drone. A pilot may fly a drone 30 minutes BEFORE sunrise and/or 30 AFTER sunrise only if the drone is equipped with anti-collision lighting that can be seen from at least 3 miles away. In this question, you may be tempted to remember the 30 minute rule and select answer choice A, 10 minutes (since that would be 30 minutes before official sunrise). However, that would be incorrect since your drone does not have proper anti-collision lighting. Therefore, our the correct answer is 40 minutes, which would require us to wait until official sunrise. What are typical characteristics of unstable air? This question requires you to know some basic information about weather theory, specifically air masses. In aviation weather, there are two types of air referred to as either “stable” or “unstable” air. For reasons that are too long and too complex to try to explain here, stable air is generally characterized by smooth flying weather and poor visibility, and continuous steady precipitation. Unstable air masses are generally made up of areas where there is a lot of quickly rising warm air. This usually is characterized by good visibility, lots of turbulence, and showery precipitation. If the center of gravity on your aircraft is too far aft (rearward), what is the likely result? The center of gravity is the point in the aircraft where the aircraft is perfectly balanced. When this balance is out of line, it can affect the aerodynamic performance of the aircraft. The center of gravity can be too far aft (which means too far back towards the rear of the aircraft), when the aircraft is not loaded properly. To answer this question properly, you also need to know what a “stalled position” is. In short, when an aircraft’s wings are no longer generating lift, they are in a “stalled position.” A stall occurs when the aircraft’s wings exceed their “critical angle of attack” which, plainly speaking, is the difference between the direction/angle that the wing is pointed and the point where the air is hitting the wing. This often can happen when the aircraft’s speed is too slow. Air is not able to flow over the wing with enough velocity to generate lift for the aircraft. To recover from a stall, pilots will pitch the nose of the aircraft DOWN in order to reduce the angle of attack, build up more airspeed, and have ample airflow over the wing. If the center of gravity is too far aft (remember: rearward), it will be difficult for the pilot to pitch the nose of the aircraft forward and recover from the stall. See the diagram below for an illustration of this concept. This diagram comes from the FAA Weight and Balance Handbook. 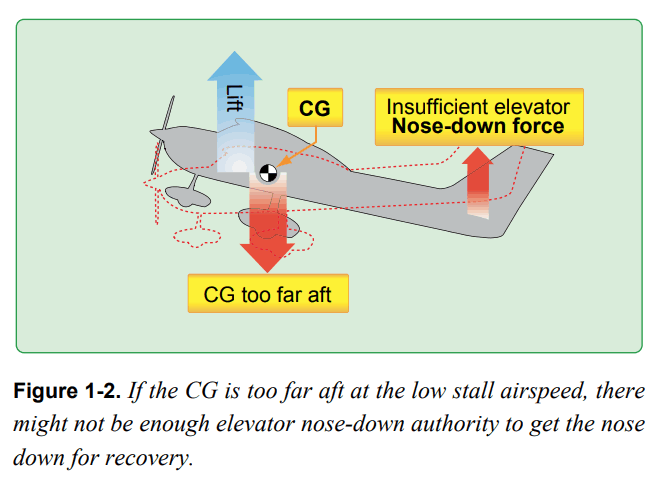 So our answer to this question is that having the CG to far aft will cause the aircraft to have difficulty recovering from a stalled position. (Refer to FAA-CT-8080-2H, Figure 26, area 2) While monitoring the Cooperstown CTAF you hear an aircraft announce that they are midfield left downwind to RWY 13. Where would the aircraft be relative to the runway? A) The aircraft is East. B) The aircraft is South. C) The aircraft is West. So, the first thing you need to figure out in this question is which direction “runway 13” is facing. If you were landing or taking off on runway 13, your aircraft would be on a heading of 130 degrees (a southeast direction). You can see from looking at the Cooperstown airport symbol on the chart that there is only one runway, and it faces northwest and southeast. All runways will have two numbers at each end. Those two numbers indicate the magnetic heading of the runway (with the zero at the end of the number dropped). So runway 09 would be facing 90 degrees (due East) if you were taking off or landing on that runway. So now that you know which direction the runway is facing, you need to know what “midfield left downwind” means. Every active runway at an airport has a traffic pattern. Think of this as an imaginary “roadway” in the sky, shaped like a box around the runway. There are several different “legs” of the traffic pattern and each traffic pattern will be “right traffic” or “left traffic”. Left traffic patterns mean that the aircraft will be making a series of left turns as it flies through the traffic pattern. 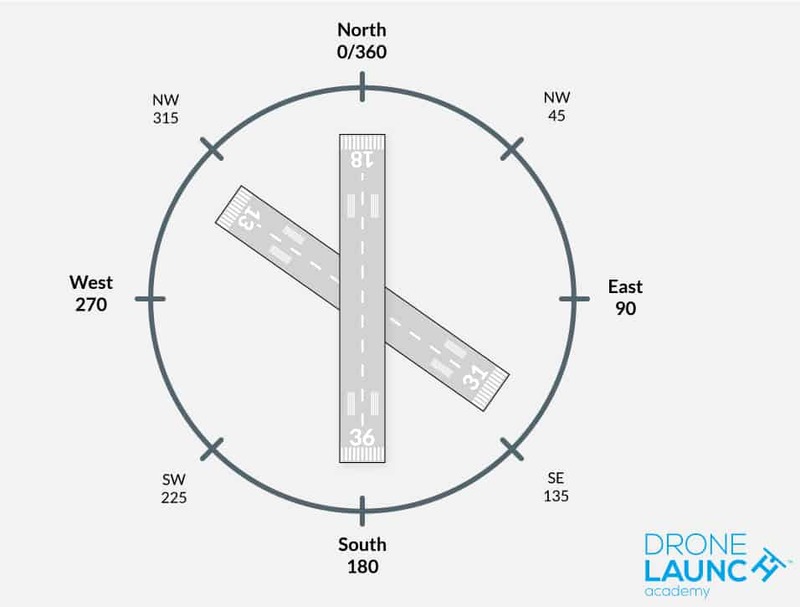 In a traffic pattern, the “downwind” leg is parallel with the runway. If the aircraft is “midfield” on the the left downwind leg, that means they are about halfway through the downwind leg in a left traffic pattern. If the aircraft was flying a left traffic pattern and was halfway through the downwind leg, it would be east (and a little north) of the airport. In this instance, North or North East are not answer choices, so East is the best answer choice in this question. You are at dinner with a client and enjoy a glass of wine, after dinner, your client asks you to demonstrate some maneuvers with your small UAS. Under Part 107, would this be allowed? As we discussed in a previous practice question, Part 107.27 states that all remote pilots must follow the same alcohol rules as regular manned aircraft pilots, which are found in 14 CFR Part 91.17 and 91.19. In the above example, you just consumed a glass of wine, therefore would not be able to operate a drone under Part 107 rules until you met the 8 hour rule, along with the other provisions of Part 91.17. What is the purpose of a Common Traffic Advisory Frequency (CTAF)? Airports with no towers (or with towers that are only open part of the time) rely on pilot self-reporting for air traffic management. Pilots will either report their position to a Flight Service Station, a UNICOM monitor, or will announce their position to whomever may be listening to the designated Common Traffic Advisory Frequency (CTAF). These frequencies can be found in several places, such as next to the circle with a “C” inside of it on the sectional charts, in the Chart Supplements, and often in other various sources of airport information. (Refer to FAA-CT-8080-2H, Figure 21, area 1) How tall is the tallest tower in the group of towers approximately 15 statute miles south of Minot International Airport? This question is an example of where the FAA might try to trip you up for not reading carefully. When you are asked about tower heights, you will always want to refer to the above ground level (AGL) number. Remember in a previous question we talked about how obstruction (i.e., tower) heights are displayed on sectional charts. The mean sea level (MSL) height will be displayed on top and the above ground level (AGL) height will be underneath in parenthesis. If you look at the group of towers that the question is talking about, you will see two towers that seem much higher than the rest. One of the towers reads 3,149 on the top and 1,031 in parenthesis underneath. The other tower reads 3,147 on top and 1,081 in parenthesis underneath. It may be tempting to choose the larger top number, since it shows up in our answer choices and is the largest number numerically (the other numbers start with 2 and 1). But if you remember, the AGL height of the tower will tell you how high the actual structure is, not the MSL height. MSL height just tells you how high that tower is above sea level and has no bearing on how high off of the ground the structure goes to. If you look at the numbers in the parenthesis underneath, you will see that 1,081 AGL is the larger number. 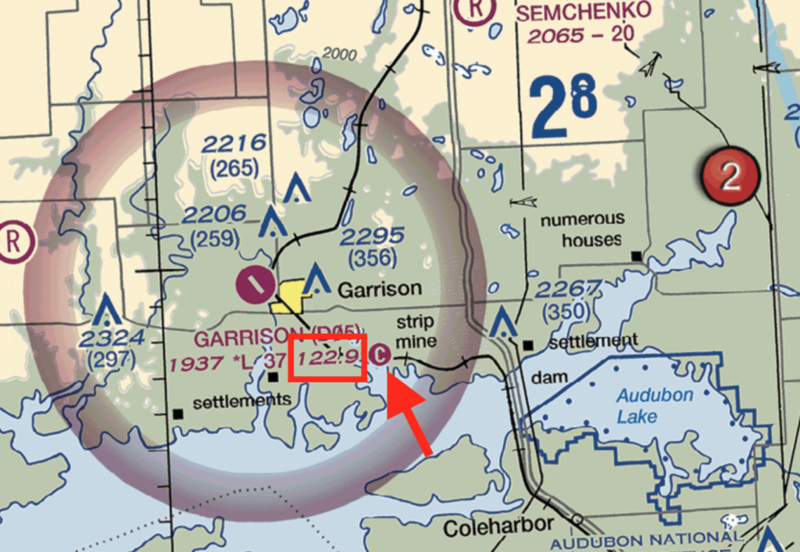 (Refer to FAA-CT-8080-2H, Figure 22, area 1) What is the floor of controlled airspace around Sandpoint airport? This question is similar to one of the earlier questions we went through (see question #2). Under question #2, there is a detailed explanation at how to arrive at the answer for these questions, so we will only quickly go over that info here, but will touch on the key points in this question. If you remember back to question #2, for this type of question, we will need to know what type of airspace surrounds the airport, along with the elevation of the airport. We can see that a shaded magenta ring surrounds Sandpoint airport, meaning that Class E airspace begins (the floor) is at 700 feet AGL. We can look at the answer choices and see that 700 feet AGL is not an option, so we will need to figure out what that altitude is in MSL at Sandpoint airport. 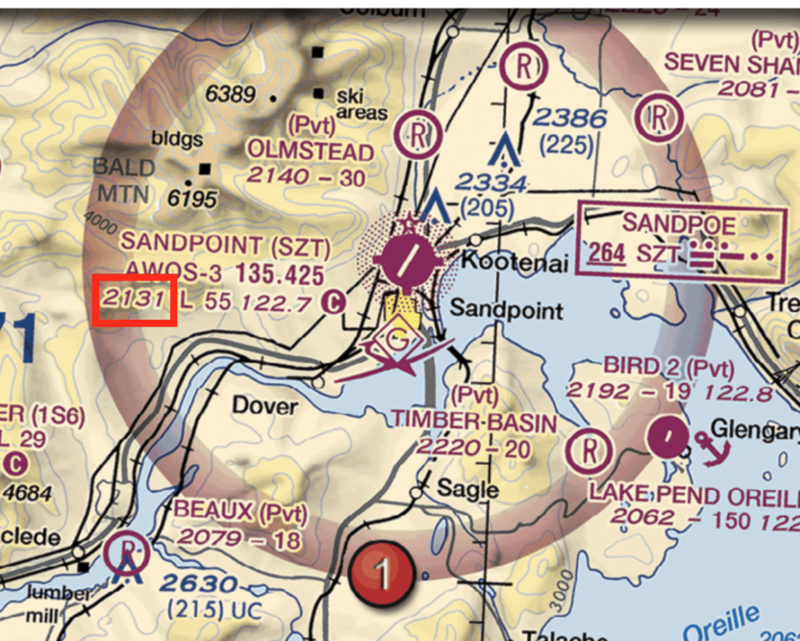 If you look at the airport information on the sectional chart for Sandpoint, you’ll see that the airfield is at 2,131 feet MSL. If we add 700 feet to this, we will get 2,831 feet MSL. (Refer to FAA-CT-8080-2H, Figure 78, Southeast quadrant of chart) You’ve been asked to inspect a railroad beginning at the town of Onawa and ending to the south, in Blencoe. Which of the following is true? A) A remote PIC would NOT need to receive prior airspace authorization from the FAA, since the proposed route would not take place in controlled airspace. C) A remote PIC would need to receive prior airspace authorization from the FAA, since the proposed route takes place within 5 miles of an airport. 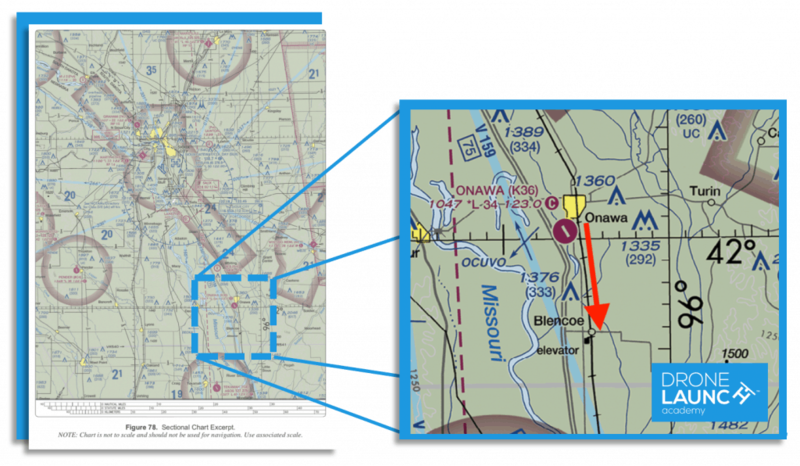 This question will test your ability to first find a location on the sectional chart and then determine if you are operating in uncontrolled or controlled airspace. When I had this question on my exam, it took me forever to actually locate where Blencoe and Onawaw were (small black dots and text on the chart). So if anything, hopefully we can shortcut that for you! Once you find Onawa and Blencoe, you can follow the railroad path to see what airspace it goes through. As you will notice, there are no markings that would indicate any controlled airspace, thus no prior airspace authorization would be required before conducting this flight. Also, note that answer choice C is incorrect because we can see that this is a commercial operation (inspecting a railroad). Commercial operations are conducted under the Part 107 rules. The Part 107 rules only require prior authorization from the FAA if you are going to be entering controlled airspace. If this was a recreational flight (operated under Part 101 rules), we would have to notify the Onawa airport before flying, since we are within 5 miles of the airport. I hope you found this 21 questions guide helpful in your preparation for your Part 107 exam! If you are studying for your Part 107 exam and are looking for more in-depth study prep, you will want to check out our Part 107 Exam Prep Course. It will take you through everything you need to know for the drone exam, step-by-step. Its loaded with lots of helpful videos, quizzes, practice tests, and more. Click here to get the first 5 lessons for free!